Trump's Approval Rating Is Stabilizing. That Might Mean He Should Work More With Democrats Amid hurricanes and working with Democrats to keep the government open and raise the nation's debt limit, Trump's approval rating has stopped its decline and has even rebounded slightly. 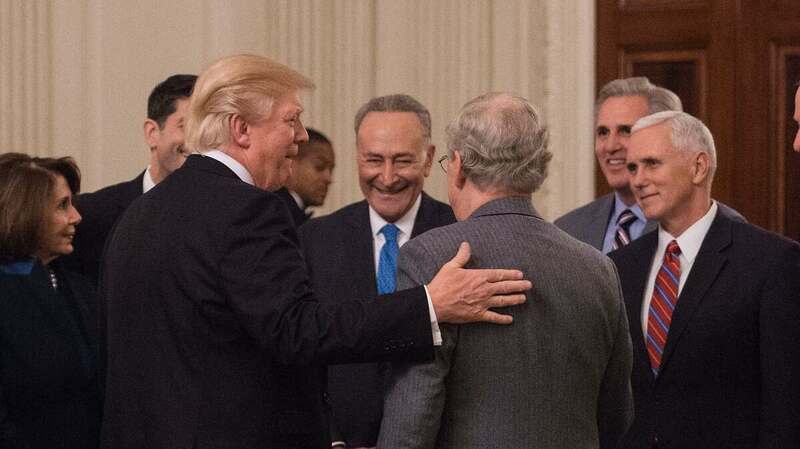 President Trump's cooperation with congressional Democratic leaders Nancy Pelosi (left) and Chuck Schumer (center) appears to have won public approval. President Trump's poll slide appears to have stabilized. Trump, who came into office with the lowest recorded approval and favorability ratings of any president, saw a steady decline in the months that followed his inauguration. Amid a lack of legislative achievements, a controversial travel ban, a drip-drip-drip of news on the special counsel's investigation into whether there was collusion between the Trump campaign and Russia during last year's presidential race, as well as Trump's divisive remarks on the racist violence in Charlottesville, Va., the president saw his approval ratings go from an average of 44 percent shortly after his inauguration to 37 percent by mid-August, according to an average of the polls aggregated by RealClearPolitics. When a president's approval rating drops below 40 percent, it is usually a bad sign. What's more, a whopping 57 percent disapproved of the president. That is a 20-point net difference — and a remarkably high number of Americans disapproving of their president. Of course, Trump had similar numbers during the 2016 presidential election, and he still won. And there is evidence that in many of the states and counties Trump flipped from Democratic hands in 2012, his brand is still holding up. But Trump seemed to recognize there was still a problem. The president appears especially attuned to his media coverage. "This guy gets better press than me," the president is fond of saying, with a hint of envy, about people he either wants to draw closer — or warn. Finding someone who got "better press" than Trump would not have been tough to do a month ago. So he made several changes, swapping out many of the key players from his first days in the White House. One notable shake-up happened at the chief of staff position, the gatekeeper for the president. He named Gen. John Kelly, who had been his secretary of homeland security, to the job in late July, and after a two-week dip that ended in mid-August, Trump's approval rating has stabilized and even rebounded slightly to an average of 41 percent, as of Friday. His disapproval rating was 53 percent. That 12-point net difference between his approval and disapproval is an 8-point gain since his mid-August low. 3. Not to be overlooked, Trump sided with Democrats over Republicans to temporarily fund the government and raise the debt ceiling for a few months. And that change? It appears to be because of Trump working with Democrats. The poll found that 71 percent approved of Trump's move. That was far more positive than almost anything else Trump has done, according to the poll. Half or more than half of those surveyed, in fact, disapproved of his handling of health care, race relations, climate change and the environment; his use of Twitter; and his response to Charlottesville. Moral of the story: The more positive marks and headlines Trump receives could push him more toward finding opportunities to work with "Chuck and Nancy," especially if the latest health care bill in Congress, which is being pushed along the Republican Party line, fails.